Little did anyone ever expect a text heavy, eccentric, Japanese video game series about courtroom dramas to become so popular worldwide, yet today Ace Attorney stands as one of Capcom’s most recognisable franchises. With six main releases, a handful of spin-offs and oddly guest appearances in a couple of fighting games, there’s a huge wealth of material to discover and relive in this franchise (there really are, check out some series stats here). Every episode in the series has its high and low points, so to share some strong Ace Attorney love we’re reviewing each episode from the series. Spoilers of course will be minimised, but due to the nature of the games, they aren’t exactly avoidable. So let’s begin by going back to the start. 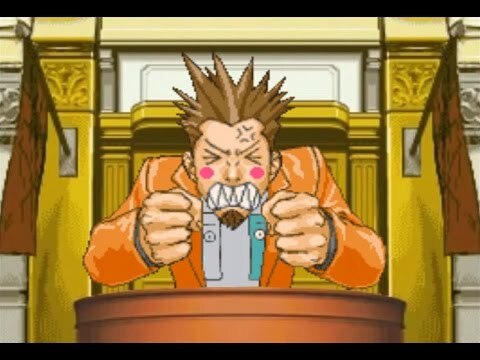 This is the first ever episode in the Ace Attorney series and the first time the series hero, Phoenix Wright, appears behind the defence’s bench as a qualified attorney. In terms of the timeline, there’s loads of material preceding this case, but these are matters for another day (although if anybody is interested in studying the Ace Attorney timeline, Kotaku have a great little piece here). The point is, this is the case that introduces to this world and its characters. As such, it’s the shortest and simplest episode the series has to offer. Mia Fey appears by Phoenix’s side in this episode. She’s a no nonsense mentor and acts as a pillar of strength for our hero in moments of doubt. The case at hand involves Phoenix defending his friend, Larry Butz, who is accused of murdering his girlfriend simply because he was in the wrong place at the wrong time. However, there is no mystery to who the true culprit is, instead series creator and writer Shu Takumi ‘wanted players to focus on the thrill and excitement of nailing the culprit’. Other characters introduced to us are Phoenix’s mentor, Mia Fey, whose significance grows in cases to follow, Winston Payne, the feeble prosecuting opponent, and the judge, who becomes one of the most lovable characters of all despite his relatively plain appearance. Despite this, the real focus is certainly on catching the true killer in court and so everyone in this case really plays towards this common goal. This allows first case to be a thrilling run, which is pretty difficult to put down. Ultimately though, this is a practical episode and if anyone were to replay it, we’d find very little room to stray from the main goal. The villain in this case, Frank Sahwit, has testimony longer than the judge’s beard, but pressing any statement really doesn’t provide much extra material for us to invest in. The flaws in his statements are extremely obvious and, if experienced a second time, questions how this case could ever have had another suspect to begin with. There is fun to be had by answering Mia’s questions at the start as wrong as possible, something not many players would likely delve into first time around. Ultimately, ‘The First Turnabout’ does everything it needs to for first time players, but doesn’t really add anything but a short burst of nostalgia for long-time fans. Highlight Moment: Having Mia come up with lame excuses to leave after telling the judge she’s the defendant in the case. Stupid answers are not tolerated in court Phoenix! If anyone would like to read more about ‘The First Turnabout’, then check out the link below!